MONTANA BEAR TRAGEDY: This is a very sad story about a bear … Everybody should heed the warnings not to feed wildlife because they become dependent and don’t forage for themselves any longer. It is such a tragedy to see what has been done to our country’s wildlife. Animals that formerly were self-sufficient are now showing signs of belonging to the Democratic Party. They have apparently learned to just sit and wait for the government to step in and provide for their care and sustenance. 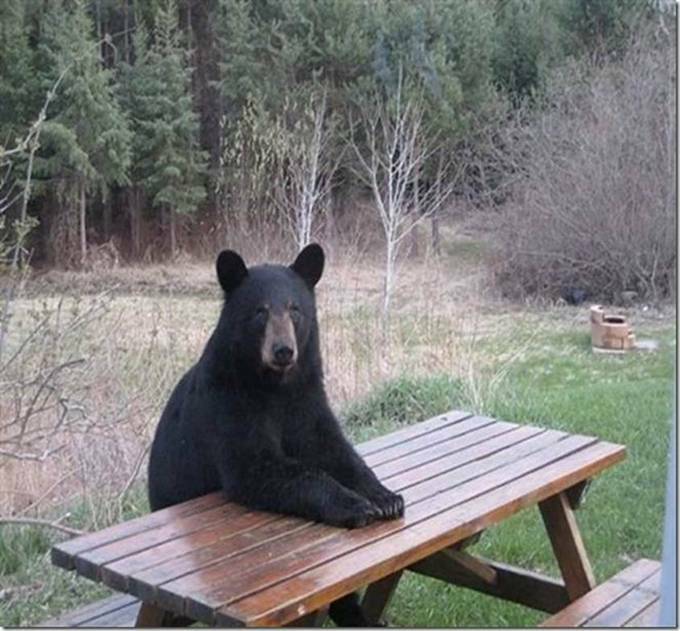 This photo is of a black bear in Montana turned Democrat. He’s nicknamed Bearack Obearma. It is believed that he has become a campground organizer. OKLAHOMA HIGHER EDUMAYCAYSHUN: This week there was a story on our local news about a principal at a school that was worried about the low grades of students, affecting how others saw his performance and the standards of his school. So when he came across a student with several D’s on his/her report card, he would go into their records and change them to a C. Which of course reflected more positively on the student with poor skills and the educational facility that issued his/her report card. So the next time you are in some fast food joint and they get your order wrong, think back to this little tid-bit of information. It might not be the kid’s fault at all. GOD BLESS APPLE COMPUTER: Here is today’s trick question, “Are you stupid enough to spend almost $700 on a telephone?” The things people will do for the simple pleasure of having their very own status symbol. And the pain doesn’t stop with the checkbook. I got this in the email recently. Today, while I was at work, my sister stole my iphone and tested to see if it can survive a 40 foot drop, just so she can be a youtube sensation. My apple ipad is now destroyed and she has 83 views. I know this is totally off topic but I had to share it with someone! Last word I heard on this was the victim was taking a scalding hot shower and vigorously scrubbing her body with steel wool. No word on the whereabouts of the errant sister. WHERE THERE IS A WILL … THERE IS A WAY: A German teenager whose farmer parents would’t buy her a horse put a saddle on a cow and trained her to gallop and jump over barriers. She now rides the 2-year old heifer, named Luna, every day. At first, she said the cow got a “little bit peeved” at having a human on her back, but now can gallop like a horse. She even responds to commands, do jumps, and who knows, maybe she now actually believes she is a horse? 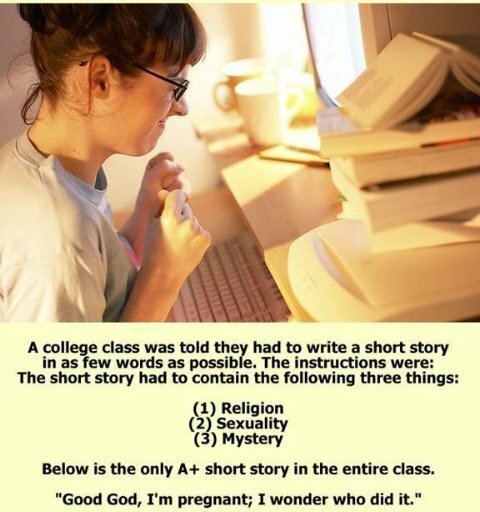 THE WORLDS SHORTEST COLLEGE PAPER: This is too funny and just too brilliant, you have to love it and leave it to a woman to come up with it. Post Script: I have been receiving a lot of negative email on my comments on the so-called debate the other day. I would like all of you to know (those that are sending me this crap) I feel the comments were just fine and they will be allowed to stand. Most likely this post will get me some more. If you want another persons outlook on it, here is the link, he describes it far better than I did.